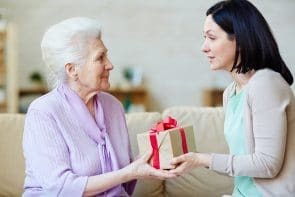 A gift is a great way to help preserve a relationship, but in making a gift on behalf of another person you must consider what authority you have in doing so. At all times you must try to include the person making the gift and determine whether they have capacity to make the decision themselves. The Metal Capacity Act 2005 sets out the key criteria for assessing a person’s capacity to make a decision and requires that a gift be in the best interests of the person making it. Only when you are sure that the person cannot make the decision in question can the deputy or attorney decide for them. Who should you give gifts to and what should they be? Affordability is a key consideration that must be taken into account when considering a gift. The deputy or attorney must contemplate the age of the person who lacks capacity, their current needs, their likely future needs and the resources they have available to draw upon for the rest of their lives. After a gift is made, a person must still be able to comfortably meet their needs. The person’s wishes and views should also be considered before making any gifts. It is possible to accept a gift for yourself, however the Court of Protection may look carefully at whether you went beyond your authority in doing so. A Deputy or Attorney must not allow themselves to be pressured into giving gifts. If the gift does not fall into all of the above categories then an application to the Court of Protection is needed to approve the gift. If you do not, and still make the gift then the Office of the Public Guardian (OPG) may launch an investigation into your role as deputy or attorney, issue a warning to you and in the worst case scenario remove you as attorney /deputy. As an unauthorised gift is a breach of duty as a deputy or attorney, there could be further investigations into fraud from this if passed to the police by the OPG. Further advice and guidance on gift giving can be found in the guidance note produced by the OPG or if you would like some advice from our specialist team of deputyship solicitors at Hodge Jones & Allen, please call 0800 437 0322 or request a call back by filling out our online contact form.